This entry was posted in Faculty and tagged award, College of Liberal Arts, political science on July 5, 2012 by Wire Eagle. AUBURN UNIVERSITY – Kathleen Hale, an associate professor of political science in the Auburn University College of Liberal Arts, was recently honored at the National Association of Drug Court Professionals, or NADCP, annual conference in Nashville. Hale was named one of three recipients of the organization’s media awards, which are given annually to individuals or outlets that have demonstrated outstanding coverage of drug courts or the NADCP. 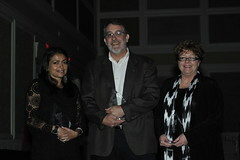 Other recipients included Moni Basu of CNN and Bill Rankin of the Atlanta Journal-Constitution.